Thyroid Fad: Over-Treatment Based on TSH! Some tests are valid. TSH is misleading yet a main screening test. Commonly people go for annual physicals in order to catch problems ahead of time –a very reasonable attitude. Sometimes this leads to unnecessary anxiety if normal lab values are not truly representative of danger. Cholesterol testing is one example mentioned in a separate blog. Blood pressure can be over-read as well. In my private practice, I am seeing another fad that leads often to unnecessary treatment — over-reading of thyroid function tests, most notably TSH. The thyroid gland, located in the neck just in front of the larynx and surrounding it. This small gland is responsible for governing the metabolic rate of the body as a whole. It adapts to changes in the pace of life — whether from stress or illness or workout regimes or seasonal weather change. This is all done automatically and seamlessly. We don’t notice the changes. Like all organs, it may malfunction some of the time or in some people. Under-functioning leads to low energy, chilliness, weight gain, slow mind, and constipation — common complaints in other settings as well, of course, particularly sleep deprivation. Over-functioning leads to body heat, weight loss, anxiety, and rapid heart beat — also common reactions to stress itself. 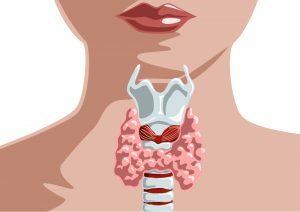 Then there is thyroiditis, where the body’s immune system attacks its own thyroid, causing wavelike alternating phases of hyper- and hypo-functioning over spans of weeks or sometimes months. Over- and under-functioning usually are mild, as is thyroiditis. Nevertheless, extreme and dangerous cases do rarely happen in hypothyroidism as a condition called myxedema; hyperthyroidism can rarely result in thyroid storm. In addition, there can be thyroid cancer, or thyroid nodules (usually benign). Thyroid function interacts intimately with the pituitary gland located at the very base of the brain inside a small protective bony cup. The pituitary emits TSH (Thyroid stimulating hormone) that tells the thyroid to work harder. The thyroid then emits T3 (faster acting) and T4 (longer acting) hormones that govern metabolic rates of cells throughout the body, in every organ. T3 and T4 then feed back to the pituitary to create a feedback loop with TSH. Twenty years ago, T3 and T4 were the only tests replacing BMI (Basal Metabolic Rate) to diagnosis dysfunction. In mid-1990s, a new test was developed — TSH. Famously, TSH was described as an oversensitive test. This meant that it varies rapidly from hour to hour and day to day. It also means that there are a lot of false-positives and false-negatives when compared with T3 and T4. Most physicians liked the idea of an oversensitive test. They tend to say that if they put someone on thyroid hormone medication, TSH testing enables them to control the dosage with accuracy. A more thoughtful caution, though, is that such an approach means putting people on medication for a possible false-positive. Being on medication then shuts down thyroid gland function, so they effectively end up with doctor-induced hypothyroidism. People generally tolerate this relatively well, but there is a subtle change — difficulty making adjustments to changes in stress or workouts or weather change or travel. Instead of a flexible thyroid gland they have a routine dosage of medication. TSH: Kirk Yelling at Scotty on Star Trek! Because doctors like oversensitive tests so much, lab screening for routine physicals have often settled on TSH for measuring thyroid function, ignoring thyroid-output T3 and T4. This leads to frequent over-treating because of false-positives. If a patient requests all three tests, it is common to find high TSH and normal T3/T4. I see this a great deal in practice. Literature insists that this is heralding an impending hypothyroid or thyroiditis state. However, there are no progressive studies that I have found to support this supposition. In my practice, it is very clear that there is a high correlation between high TSH and sleep deprivation and/or stress. Apparently, when stress is high the brain activates the pituitary to ask for more response from the thyroid. The engine is damaged (true hypothyroidism with low T4, maybe low T3). Kirk has a perfectly normal engine that he needs to redline because he is in trouble (stress, especially sleep deprivation). So TSH is more often a measure of stress than thyroid function! No one should go on medication without first getting T3 and T4 testing! A further validating correlation found in my practice: TSH in Silicon Valley is 12-15 (rather than lab normal of 4.5 upper limit). In Silicon Valley, people brag about how little sleep they get — usually in the range of 5 or 6 hrs/24 hrs instead of the biological need of 7 or 8 hrs/24 hrs. 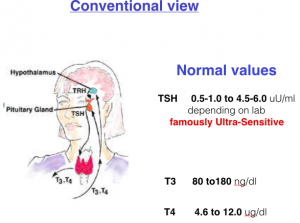 So, TSH is chronically high even though thyroid is normal!